I do bake all day at work, but when this time of year rolls around, I’m also more than happy to dial up the oven when I get home. The kitchen is the coziest place in this old house on a chilly day (we really need to get our front windows replaced!). When a new book called All About Roasting: A New Approach to a Classic Art by Molly Stevens found its way into my hands, I immediately began plotting out a Sunday roast-fest! The book goes into great detail about how to perfectly roast meat and fish, the science behind it and how to get the most out of the technique, but there are also recipes for gorgeous roasted veggies and fruits. Steven’s Roasted Brussels Sprouts with Capers and Lemony Browned Butter will for sure be on my Thanksgiving table, and maybe I’ll show you those later, but that I assume you are here for the sweet stuff. My CSA has given me four bags of apples in two weeks, so I’m just searching out things to do with them. 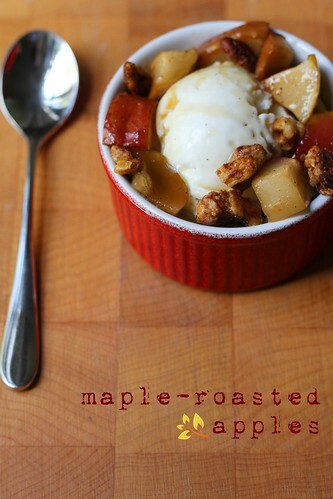 Then my eyes hit this recipe for Maple-Roasted Apples with Candied Nuts, and I knew it would be the first one I’d try. This has the same warm, sweet flavors of baked and stuffed apples, but they are so much easier to prepare…no tedious hollowing out or accidentally ripped skins. Here, I followed the author’s suggestion to sever these apples warm over vanilla ice cream, but I can tell you that they are also great over waffles (that’s what I did with the leftovers) or pancakes, and I can’t think of a better topping for oatmeal. Steph’s Note: Prefer your apples with cinnamon or vanilla? Feel free to switch out the nutmeg and ginger for whatever spices you’d like. -Position racks in the top and lower thirds of the oven and heat to 400°F (or 375°F if you are using convection). Line a large heavy-duty rimmed baking sheet and a smaller sheet (like a quarter sheet tray) with foil, parchment or Silpats. -Cut the apples into quarters (it’s up to you if you want to peel them first…the skin does look pretty and helps the pieces hold shape). Remove the cores/seeds and cut the quarters into 1/2-inch cubes. Pile the apples onto the larger baking sheet. In a measuring cup or small bowl, stir together 1/4 cup maple syrup, 3 tablespoons melted butter and the nutmeg, ginger and a pinch of salt. Pour the mixture over the apples, toss to combine and arrange in a loose single layer. -Roast the apples on the bottom rack, tossing after 15 minutes and every ten minutes thereafter so they roast evenly, until soft and slightly caramelized, but not completely collapsed. This took me 25 minutes here, but may take as long as 40 minutes. -Meanwhile, pile the nuts on the smaller sheet and drizzle with the remaining 1 tablespoon maple syrup, 1 tablespoon melted butter and a pinch of salt. Toss to coat and spread out in a single layer. Roast on the top rack above the apples, stirring once or twice until they are toasty brown, about 10 minutes. Let the nuts cool before serving, and they will become crisp. -Serve the fruit warm as a topping for ice cream, oatmeal or whatever you choose, and drizzle any juices from the pan over top. Scatter with candied nuts and serve. If you are storing this, keep the fruit and juices in a covered container in the refrigerator, and reheat at 350°F for about 10-15 minutes to warm slightly. Keep the nuts in a separate continued at room temperature. Please note that the publisher, W.W. Norton, sent me a copy of this book…but I just bought another copy for a friend! I will definitely be giving this a try! I loved Steven’s book, All About Braising, and I imagine this new one is just as informative. I love your picture, too (as always!). Soumds like a healthy Thanksgiving tecipe!